Almo Nature Daily Menu is an exceptionally high-quality wet food suitable for adult cats of all breeds. Every ingredient is of the highest poΒible quality and completely natural, containing no artificial preservatives, aromas or colourings. This makes each meal easy for your cat to digest, ideal for cats with sensitive stomachs or food intolerances. 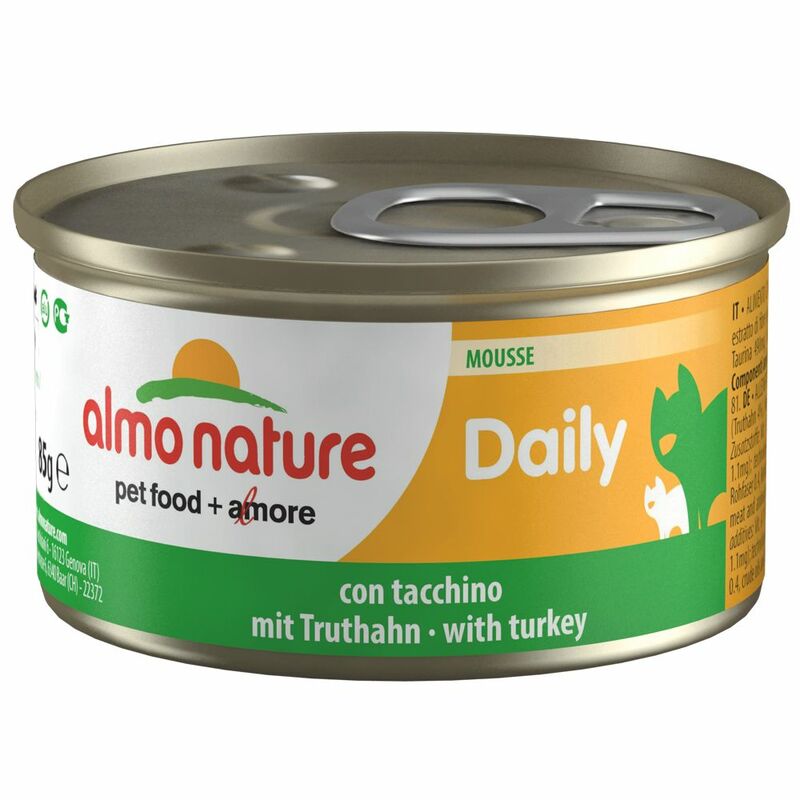 The high animal protein content makes this food delicious for your cat, and the addition of important minerals and vitamins means that Almo Nature Daily Menu provides your cat with a balanced, healthy diet. Each meal contains added taurine, an eΒential nutrient for cats which they cannot produce in sufficient quantities in their own bodies. Cats need taurine to support their vision and heart function, as well as healthy skin and fur, so it's eΒential that their food contains enough to keep them healthy. Each meal also contains further important vitamins, providing your cat with everything it needs for a healthy, active life. Almo Nature Daily Menu 24 x 85g at a glance: Balanced complete cat food With high-quality, nutritious ingredients of premium pet food quality In a range of fabulous flavour varieties in MouΒe or Chunks Cooked in its own stock: this natural method preserves nutrients, as well as giving fabulous flavour and digestibility Beneficial nutrient mix: with valuable proteins, vitamins and minerals With taurine: to support heart, nerves and eyesight Natural: sugar-free, as well as free from artificial additives such as colours, attractants and preservatives An every day luxury: for a well-rounded supply of nutrients. Price just £8.99! Click here to buy now!